Upgrade and Save Energy By Using A Fireplace Insert. Fireplace inserts are made to increase efficiency. They are constructed of steel or iron, and fronted by insulated glass to generate heat to keep the home warm and comfortable during wintry days. The very best part is the fact that they fit perfectly into an already existing firebox, increasing the home heating capacities and energy efficiency. Furthermore, they often have blowers installed in the front or across the sides, which increases effectiveness and temperature circulation. Some inserts comes with a self-cleaning options, a thermostat control and even more. 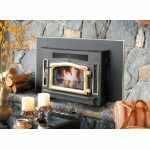 Various kinds of fireplace inserts are available such as wood-burning inserts, gas inserts, and electric inserts. These inserts are classified based on the kind of fuel used. Gas: It is among the best options for your home. They very efficient, promoting better circulation of air through its blowers and are fueled by natural gas or propane. Today's gas fireplaces come with wall installed thermostats and a remote controls for controlling the gas for a much added convenience. Most inserts even adopt a two-pipe system, called a sealed combustion, where external air for combustion is brought to the fire place via one of the pipes and the flue gases are sent out by using a smaller pipe within the larger first pipe. After the gas fireplace insert is installed, it won't require too much maintenance. Wood-Burning: They are more technical and require a good amount of wood, however, these products do help in lowering energy costs. Most fireplace wood inserts create convectional heat with a fan placed below the firebox. The efficiency rate is around 50% less when compared to a gas inserts. Electric: They are easy to install and use compared to gas and wood inserts. The very best part about these inserts is that they are driven by electricity, reducing combustion and the necessity for venting. There are many factors that need to be considered before buying one for your home. Size is one of the main factors as the inserts should be chosen based on the existing fireplace. Gauge the width, height and the depth of the fireplace beforehand. Pick the one based on the kind of fuel used such as gas, propane, wood, and electricity. These inserts are available in various designs, colors, and customized finishes. Select a proper insert which best suits your home decor. Ensure that it gets the features you need such as thermostat control, and a handy remote control option. Check fuel requirements, installation process and a yearly maintenance prior to making the final selection. Today's fireplace inserts are a lot more efficient when compared to traditional ones. Having a superior quality insert is a superb way to save lots of money and time. Each one is unique and beneficial in its own way. Please excuse the some of the grammar and content of this article. This outsourced article was created primarily so search engines (computer robots) will have special keyword content to crawl on the Fireplace Inserts category to help you find us easier on the internet.